An unseasonably cool spring in the northern United States is being blamed for lagging boat sales. During conference calls with analysts last week, Brunswick CEO Dustan McCoy and MarineMax CEO Bill McGill each cited unseasonably cool weather for a dip in quarterly sales compared to last year, which brought a warmer-than-usual spring to much of the country. “Like all of our teams around the country, our teams in the Northeast and Midwest work very hard to create excitement for boating during the quarter, but normal spring weather has not come on time, and as a result our normal spring launch is definitely behind previous years in those regions,” McGill said. The persistence of cold, blustery weather in the Midwest and northern regions of the country — on top of the lingering effects of Superstorm Sandy — depressed sales and margins during the March quarter, McGill said. “For us, weather is not an excuse, it’s an unfortunate reality,” he said. Wayzata Marine owner David Briggs told KSTP, an ABC News affiliate in Minnesota, that ice on Lake Minnetonka has deterred sales. “Right now we are still waiting for the boats to go out on the lakes and that’s challenging to our customers and to us,” Briggs told the station. The governor’s fishing opener is in May and organizers in Park Rapids, Minn., say the show will go on despite about 30 inches of snow on area lakes. Climate scientists say melting Arctic sea ice is the driving force behind the Northern Hemisphere’s unseasonably cold spring, according to a report last month in National Geographic News.Recent imaging from the U.S. National Snow and Ice Data Center showed a historic minimum in Arctic ice cover last fall. March 2013 was the coolest since 2002 in the continental United States, according to the National Oceanic and Atmospheric Administration. Eleven states in the Ohio Valley, along the Gulf Coast and in the Southeast had March temperatures that were among their 10 coolest. 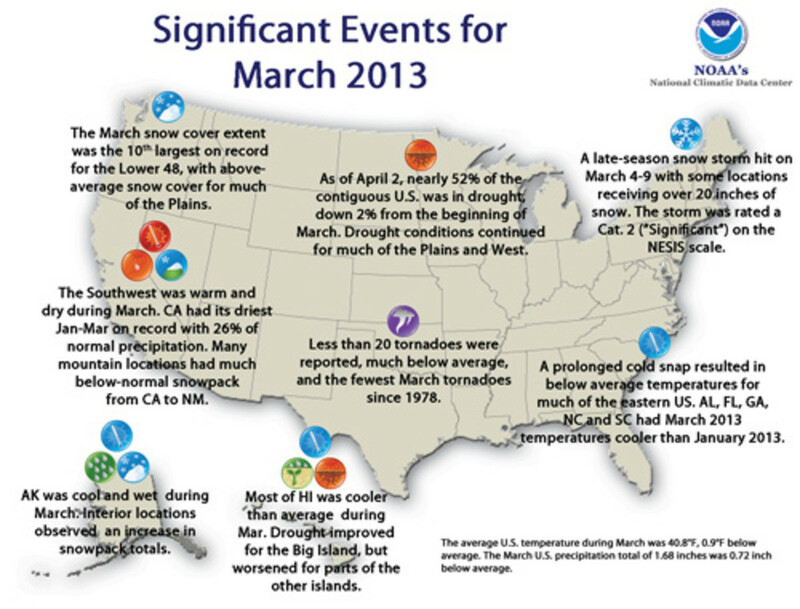 In fact, Florida, Georgia, Alabama, South Carolina and North Carolina had March temperatures that were cooler than January, NOAA reported.